An indispensable reference guide for observing the "Red Planet"
Explore our next-door neighbor planet Mars like never before with the Orion Mars Map & Observing Guide. This detailed map will help you locate and identify intriguing Martian features, and it will also help you learn interesting facts about the red planet. The Orion Mars Map & Observing Guide is a useful tool for backyard astronomers of all skill levels who want to get more out of their telescopic observations of Mars. Use the map to identify classical albedo features (light and dark regions) observed with a telescope. It also identifies over 150 Martian features using modern nomenclature. Throughout the tri-fold Mars Map & Observing Guide, you'll find sections loaded with information on dust clouds and storms, Martian seasons, polar ice caps and more. You'll appreciate the thorough list of recommended filters to help enhance visual views and astrophotos of Mars, as well as the detailed list of all upcoming conjunction and opposition events from 2014 through 2020. The Mars Map & Observing Guide measures 25.25" x 11" when unfolded, and folds up to a convenient 8.5" x 11" size for storage and transport. 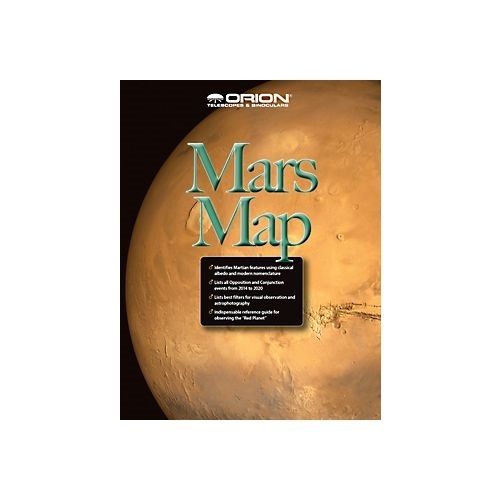 The Mars Map & Observing Guide is plastic laminated for long-lasting durability as well as protection against dew, dirt, and the occasional coffee spill.